Escape Studios has a Kickstarter up where they're making dice from lava. Don't scoff, they're already at 10x their funding minimum level. We have always been fascinated by dice. 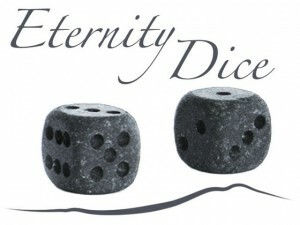 Somehow we consider them as mystical objects, but all dice we've ever bought and used to play with didn't have a soul. After a walk in Vesuvius National Park, we realized that we wanted to have dice directly from Mother Earth which would be able to evoke old world feelings now lost in the traffic of the modern metropolis. So what material could be more evocative and pleasant to the touch and sight than the lava of a volcano?